From bleak to chic in 2 weeks. The mustard velvet has a certain charm but its not a patch on the beautiful willow pattern woven cotton and blue satin piping. Getting a nice round shape at the front was a bit testing, but it has all been done traditionally and the shape benefits from it. 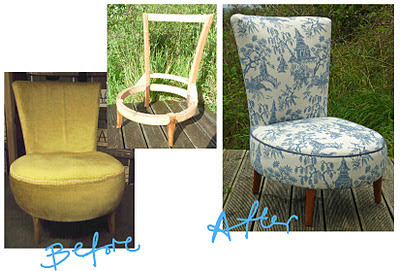 I would love to keep it but alas have no room so it will be going on my shop http://www.etsy.com/shop/UpholsterybyLaura. The great thing about this chair is that it could go anywhere, it would be lovely in a nursery or bedroom but equally at home in a bathroom or lounge.